Matt Pohlkamp came to Bowling Green as a reliable defensive player. Now, he’s regaining his scoring touch. The sophomore right wing is becoming a player the Falcons can’t live without, the result of his solid all-around play. Pohlkamp has three goals and six assists, and an on-ice rating of plus-3 in the Falcons’ first 12 games. Next for Pohlkamp and the Falcons is this weekend’s Western Collegiate Hockey Association series against Bemidji State. Faceoff is 7:07 Friday and Saturday nights in the Ice Arena. The Falcons are 8-3-1 overall and in the 5-1 in the WCHA. Bemidji is 3-7, 0-4. 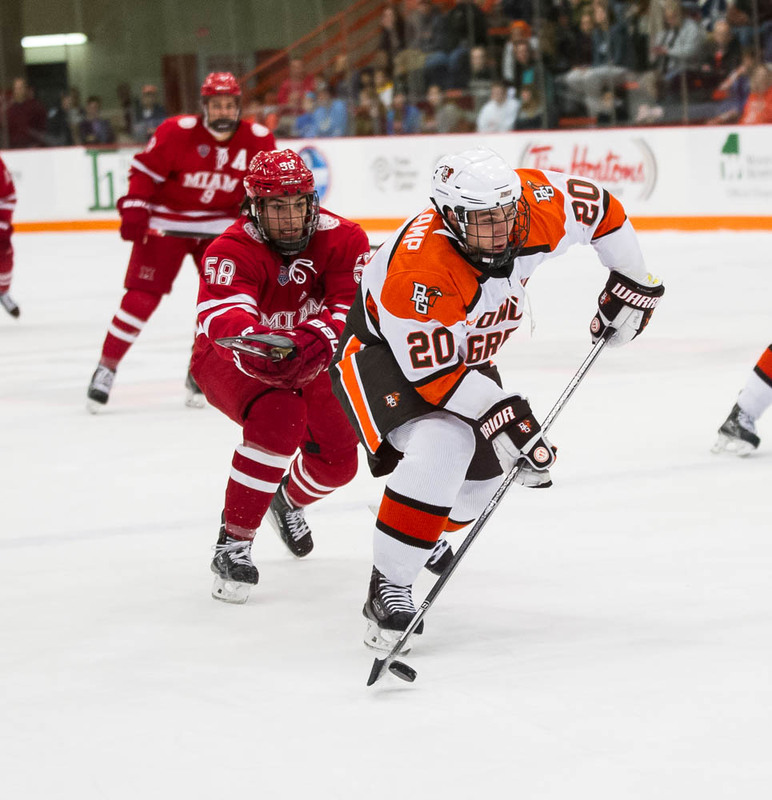 Pohlkamp has been one of BG’s top nine forwards since coming to BG after playing in the North American (Junior) Hockey League and the United States (Junior) Hockey League during the 2012-13 season. The 6-foot, 200-pounder totaled 15 goals and 17 assists in 55 games for Fargo in the USHL and Bismarck in the NAHL. “He’s had a really good opportunity since he’s been here,” BG coach Chris Bergeron said. “That opportunity wasn’t one that was handed to him. It was earned through his hard work. Prior to junior hockey, Pohlkamp was a scorer in high school hockey in Brainerd, Minn. He had 88 goals and 86 assists in 106 games in four seasons. Pohlkamp started to score again in his first season at BG last fall, totaling nine goals and seven assists, and an on-ice rating of plus-7. He was one of five Falcons to play in all 39 games. This season, Pohlkamp has a point in eight of BG’s 10 games. He’s skating on a line with classmates Kevin Dufour and Pierre-Luc Mercier. Dufour has nine goals and one assist, and Mercier has one goal and seven assists. The line has a good mix of speed and skill, and size and strength. Mercier plays center, and Dufour is the left wing. “I’m trying to take advantage of my opportunities. I’m playing with good players, and they’re creating opportunities for me to put the puck in the net,” Pohlkamp said. “Now that I’m in my second year of college, I’m more prepared for everything. During last season’s player evaluations with the coaches after the season, Pohlkamp told Bergeron the one thing he wanted to do differently last season was score more. To increase his scoring, the coaches told Pohlkamp he had to shoot more and had to hit the net when he did shoot. “We told him the details of his game needed to be better,” Bergeron said. Pohlkamp didn’t skate on the power play last season, but has earned a spot in front of the net on one of BG’s two power-play units this season. “The details of his game had to be better if he wanted to score more,” Bergeron said. Pohlkamp, Mercier and Dufour have been helped because they’re roommates off the ice. Bergeron said Pohlkamp’s defensive game was in good shape when he joined the Falcons and has become even better at BG. “The skill in college is so good, it made you realize you had to play good defense to stay on the ice and stay in the lineup,” Pohlkamp said. “If you can’t play defense, you’re not going to play, and I wanted to kill penalties. Pohlkamp also blocks shots and has been a member of BG’s penalty-killing since last season. This season, the BG penalty-killing is tied for 13th nationally at 89.2 percent. The solid defense allows Pohlkamp to play in every situation, whether BG is ahead or behind. Although Pohlkamp’s play usually speaks loudly, he’s quiet off the ice. Pohlkamp has a 3.4 grade-point average. “We knew what we were getting in Matt,” Bergeron said. “He’s always been an honest defensive player, but we didn’t know right away about how much offense he was going to bring.